Kim began accompanying professionally at a young age, honing her skills with her father’s woodwind students. During her undergraduate and graduate studies, she eagerly took on every opportunity available, gaining wonderful experience through her work with the University of Washington choirs and wind ensemble, and an array of student and professional vocalists and instrumentalists. 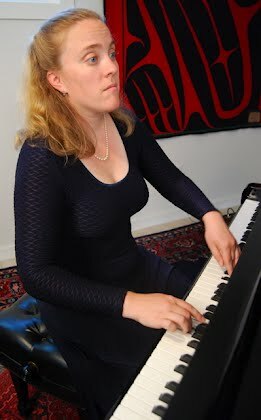 In the years since, she has worked with instrumentalists, vocalists, and ensembles throughout the Pacific Northwest. Projects have included everything from youth solo contests to performances with professional ensembles, and from church services to world premieres of works by living composers. Kim is an excellent sight-reader, has a vast repertoire, and is experienced in assisting performers at all levels in preparing for a performance or recording project. Contact her to discuss your upcoming project!